Photo courtesy of Brasserie Gallopin. Are you a bit nervous about eating out in Paris or elsewhere in France, worried you may not be able to get by without fluent French? The truth is, most waitstaff at restaurants in the French capital know basic English, so ordering or paying is rarely a problem if your French is nonexistent. Still, to really embrace the "when in Rome" spirit, why not learn a few useful words and phrases commonly used in restaurants? You'll have a more interesting experience if you can use some of this basic Paris restaurant vocabulary, and may find the staff to be even warmer when they see you're making an effort to wield some French. Use this guide to learn basic expressions and understand most signs and menu headings at restaurants in Paris.. Also see our top 5 tips on avoiding unpleasant service in Paris -- and to learn how to distinguish between truly rude behavior and basic cultural differences that can lead to misunderstandings. Prix à emporter: Prices for takeout menu items. Note that many restaurants in Paris do not offer takeout. See sections below for information on how to ask. Horaires d'ouverture/ferméture: Opening/closing times (usually found on the door outside). Note that many restaurant kitchens in Paris close after 2pm and 10pm and restaurants often close their doors entirely between 3 and 7 pm. Service continu: Continuous service (indicates a restaurant that serves food between "normal" meal times, generally between 2pm-7pm. Défense de fumer/Zone non-fumeur: No smoking/non-smoking zone. (Note that in Paris, smoking has been entirely banned in all public spaces since early 2008). 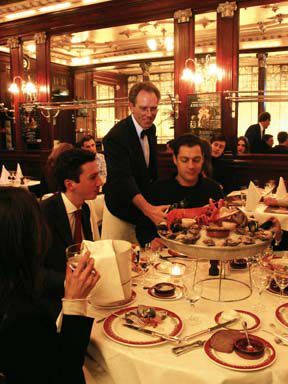 Read related: How to Tip at Restaurants and Cafes in Paris? Is it possible to order take out? Est-ce possible de prendre des plats à emporter? Read related: Using Public Toilets in Paris-- Are They Decent? How to Leave a Tip? Not sure how much to leave after your meal? You can see more about tipping in Paris here.